We live in a land of false superlatives, with advertisements constantly hyping this product or that as bigger, more powerful and somehow better. It's easy to get jaded and ignore anyone who is making a claim that something is utterly amazing. However, in a rare turn of truth in advertising, we live in a time in which scientists are about to embark on a journey that actually really is utterly amazing. Beginning in just a few days, physicists working at the CERN laboratory in Switzerland will start commissioning the largest and most powerful particle accelerator ever built -- the Large Hadron Collider or LHC. This facility will shed light on some of the oldest questions ever asked by mankind, questions of the deepest fabric of reality and the very origins of the universe itself. These are very impressive claims indeed and it is fair to wonder if the machine can deliver on it. 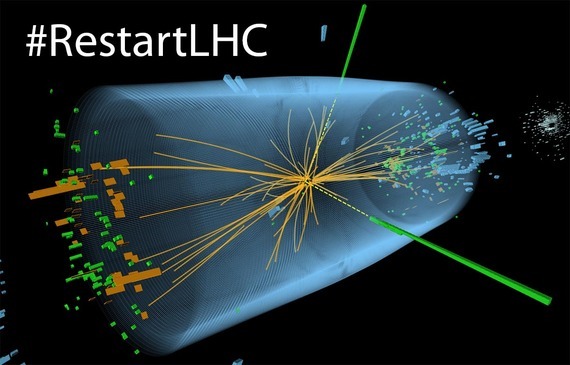 So what is the LHC? It is a huge ring, 17 miles (27 km) in circumference. In it, two beams of protons are accelerated in opposite directions until they are travelling at nearly the speed of light, which is 186,000 miles per second (300,000 km/s). These beams are then made to collide inside four huge detectors. The temperatures in these collisions are mind-boggling, well over 100,000 times hotter than the center of the sun. These temperatures were last prevalent throughout the universe about a tenth of a trillionth of a second after the Big Bang. In a very real sense, scientists are recreating the conditions of the very birth of the universe itself and studying it using the most sophisticated detection equipment ever devised. This is simply the first superlative on which this equipment can deliver. By accelerating protons to collide at the outrageous energy of 13 trillion electron volts, scientists can study objects smaller than one ten thousandth the size of a proton. Matter consists of a series of structures, ever decreasing in size: from our familiar world, to molecules and then atoms. Peering at smaller structures still, we have established that atoms are made of protons, neutrons and electrons. Over the last few decades, we have demonstrated that protons and neutrons are made of even smaller particles called quarks. In fact, the last several decades, scientists have thoroughly studied the quarks and their cousins the leptons (of which the electron is the most familiar). The theory that describes the nature of these tiny building blocks is called the Standard Model of Particle physics and it is the most successful description of the underpinnings of the universe... the very fabric of reality... ever devised. And the LHC is poised to dig deeper, looking for even smaller structures and even more fundamental rules that govern them. So we see that a second superlative also applies. The LHC has run before, albeit at only about sixty percent of the energy it is about to achieve. During that time, it discovered the Higgs boson, which was the last missing piece of the Standard Model. Scientists were both elated and a little let down by this discovery: elated because they confirmed that the Standard Model worked very well, but a little let down because not finding it would have been even more exciting. It would have meant that we'd have to rewrite our theories and, in doing so, we'd have learned a bit more about the rules that govern the cosmos. However, the universe isn't concerned with the opinion of scientists. It simply is what it is and we must discover its secrets. While the Standard Model is an extraordinary theory, it is clearly incomplete. There are still mysteries to solve. For instance, our familiar world made of atoms needs only two quarks and one lepton, yet we've discovered three times what is needed. Why? Nobody knows. Another mystery invokes Einstein's equation E = mc2, which is sometimes misstated as saying that energy can convert into matter and back. While that statement is true in spirit, when we convert energy into matter, we also make an equal quantity of an antagonistic substance called antimatter. Touch matter and antimatter together, and it annihilates back into energy. The mystery of antimatter is that we believe that when the universe was just formed, it was full of energy. As it expanded and cooled, the energy should have converted into matter and antimatter in equal quantities. Yet when you look throughout the cosmos as far as our most powerful accelerators can look you see nothing but matter. So where did the antimatter go? Again, nobody knows. A third mystery comes from astronomy. When we turn our eyes to the heavens, we see that galaxies spin faster than can be accounted for by the observed matter and the known laws of gravity. The most popular idea to solve this curiosity invokes a hitherto-unseen kind of matter called dark matter. While dark matter remains an unproven hypothesis, if it exists, the LHC might be able to make it. In a very real sense, the LHC research program might explain the night sky. These are but a few of the unsolved mysteries that the LHC can investigate. During the first running period (2010 - 2012), the LHC studied these big questions and, with the discovery of the Higgs boson, made possible its first Nobel Prize. When the machine is fully operational early this summer, it will collide beams with 62 percent more energy and many more times per second. We scientists can't wait. The summer of 2015 will be when we launch off into the unknown, studying realms never before explored by mankind. We will tease out a few more of nature's elusive mysteries and perhaps learn the answers to timeless questions.